i hope that you all had a fabulous halloween! we had a wonderful time – we hung out with family (since they get way more trick-or-treaters than our little street gets), passed out candy, checked out lots of costumes, roasted marshmallows + hot dogs over a fire + ate tons of halloween candy. if you follow me on facebook, you may have seen that, despite two costume parties to attend on saturday, neither my husband nor i had come up with a costume. since i didn’t have a lot of time to plan, + didn’t want to spend much, i knew i had to get creative fast. i put on my thinking cap, ran to the thrift store, + a few minutes later, had my costume in hand. i watched a couple tutorials on how to do a 40s-era hairdo, put on my red lipstick, + was ready to go! and the result? 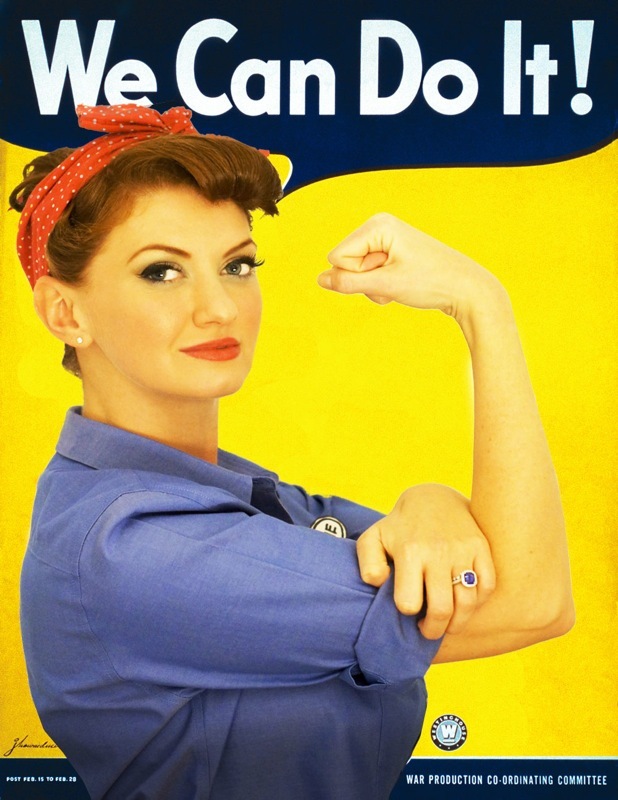 rosie the riveter! + the best part? the entire costume cost less than $10. i got the shirt from our local thrift store for a whopping $4, sewed the headband from another thrift store shirt that cost a mere $2 + wore navy pants that i already owned. my husband made me a ‘rosie’ nametag + also photographed + mocked up the above picture. isn’t he crafty? fun fact: today’s his birthday! i was super pleased with how the costume turned out + we had a fantastic time at our costume parties. i’d love to hear how you celebrated halloween, + what, if anything, you dressed up as! I love it! Creative costumes like this are the best. I may have to steal this idea for a future Halloween costume! steal away! i saved the shirt + the homemade headband, so if you decide to go as rosie next year, just let me know + i’ll hook you up! That is awesome Amy! I’m so jealous, what a great costume! That is fantastic! And what a great job on your poster. You need to print that out and frame it! Whoo Hoo! I Love that you were Rosie the Riverter! Your costume is darling! Amazing costume!! At first glance I couldn’t believe how much you look like the girl (you) on the poster….obviously I’m going a little slow this morning. bahaha! by the way, this is the hairdo that was giving me a little trouble on saturday night. thankfully, i figured it out! Awesome! You look spot-on, and totally adorable!!! Oh my goodness!! So incredibly cute! I love it. You are so creative. I think next year we totally need to have a food blogger Halloween party!! i would so be on board with a food blogger halloween party. there would be awesome food AND super creative costumes! So cute and creative. I always end up making my costumes instead of buying them. Sounds like you had a fun night. You’ve got to be kidding me. Greatest Rosie EVER! Love it. Fun! Homemade costumes are the best. You did a great job. Love the hair and makeup. How awesome do *you* look? What a great idea, and your hubby did a wonderful job on the photo–how fun!!! Have a great b-day celebration tonight! thanks so much, ashley! didn’t he do a fabulous job? he definitely earned the dinner that i’m taking him out to tonight! I love the costume!! love the poster! Isn’t it awesome having a crafty husband?! We threw a Halloween party last night…but no costumes…just for the kids. Next year I am definitely doing a costume party! yes, having a crafty husband is the best! he’s both crafty in the DIY sense + with design/graphic design, which rocks. you should definitely have a costume party next year – they’re so much fun! I’ll be honest, I saw the first image on FB and thought that was a picture of what you were doing – not that it was actually you! Really well done. Great job! So what did husband go as? Did it compliment your look? thanks, chris! my husband was hoping to go as a 40s solider, but we couldn’t find anything for him to wear at the thrift store, + the vintage army clothes at the army/navy store were super expensive. 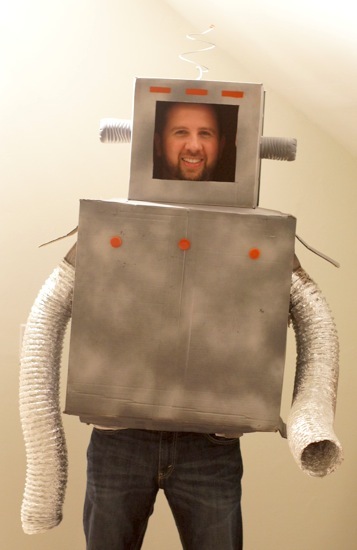 so, he went as a robot. it was ridiculously awesome! Lol! Awesome last minute costume for your husband. Awesome costume!! I am so impressed! And you look gorgeous! you are too sweet, kristen. thank you! I also didn’t realize that was you in the first photo – amazing! And I just love your husband’s costume. You are both just too talented! soo many people have said that – they thought the first photo was an ‘inspiration’ one + it took them a few seconds to realize it was actually me. it’s amazing what a little makeup + a hairdo will do to change your appearance! You look fabulous and the 40’s hairdo and makeup totally suites you! Props to your hubby, very crafty costume!! 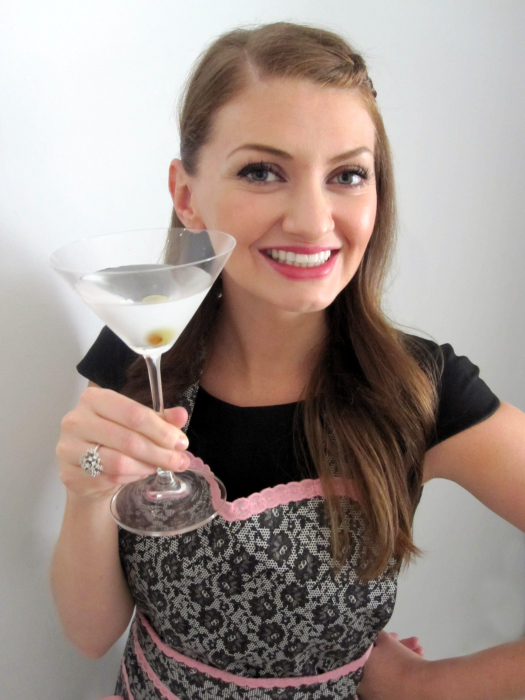 i love the looks of 40s hair + makeup – i wish i could dress up like that every day! Amy–You look precious! What a darling idea! The poster looks fantastic too! I am so glad you and your hubs had so much fun! Holy cow your costume is incredible! You look just like the original!! 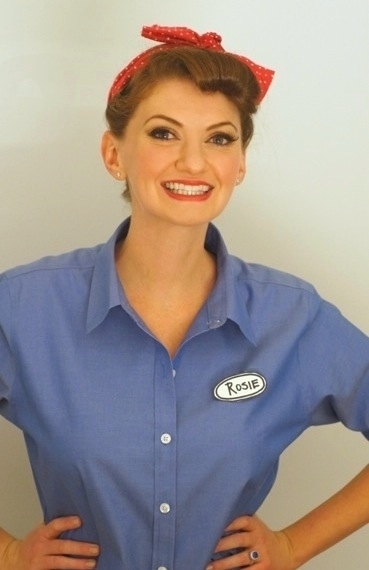 What a brilliant idea to go as Rosie and i LOVE your hair. Wow, I can’t get over that poster of you. Your hubby is one talented dude and a pretty awesome robot haha. Y’all look fabulous! Awesome costume! I always hate spending money on costumes, but struggle to come up with simple, inexpensive ideas. This one is so cute! This is miraculous. Well played Amy! This is by far the best Rosie cotume I’ve seen. You are too kind, Mark! Thanks for your nice words and I hope you spend lots more time on my blog. Enjoy the pork! Next post: our surprise wedding — featured in a magazine!